Unemployment rates for workers without a high school degree hit a record low as less-educated workers continue to be biggest job gainers in recovery. The Bureau of Labor Statistics (BLS) reported the economy added 157,000 jobs in July. With upward revisions to the data from the prior two months, the average gain over the last three months was 224,000. The unemployment rate edged down to 3.9 percent as most of the rise in unemployment in June, which was due to increased labor force participation, was reversed. The employment-to-population (EPOP) ratio rose to 60.5 percent, a new high for the recovery. In spite of the healthy pace of job growth and the low unemployment rate, there continues to be little evidence of accelerating wage growth. Over the last year, the average hourly wage has risen by 2.7 percent. There is a very small uptick to 2.87 percent if we annualize the rate of wage growth for the last three months (May, June, and July) compared with the prior three months (February, March, and April). Interestingly, there was a modest fall in hours in July, which led to a decline in the index of aggregate weekly hours from 110.0 to 109.8. As a result, the average weekly wage actually declined slightly in July. The leading sector for job gains in July was manufacturing, which added 37,000 jobs, all but 5,000 of which were in the durable goods sector. Employment in the sector is up by 327,000 over the last year, an increase of 2.6 percent. The employment services sector added 31,400 jobs, almost three times its average monthly gain of 10,600 for the last year. In the past, growth in this sector was seen as a harbinger of future job gains, but this has not been especially true in this recovery. Furthermore, the drop in average hours is not consistent with a story where firms are having trouble finding the workers they need. Restaurants added 26,200 jobs, compared to an average of 16,900 for the last year. The health care sector added just 16,700 workers, somewhat below its average of 23,800 for the year. Construction added 19,000 jobs, while retail added 7,100. Local education reportedly lost 13,900, but this is almost certainly due to seasonal adjustment issues. In spite of the complaints about labor shortages in sectors such as manufacturing and trucking, we continue to see little evidence in wage growth. The average hourly wage for production workers in manufacturing has risen by just 2.7 percent over the last year, while in the larger trucking and warehousing category it has risen less than 2.5 percent. The story on the household side was overwhelmingly positive. In addition to the rise in EPOPs, the number of involuntary part-time workers fell by 176,000 to a new low for the recovery. The percentage of unemployment due to voluntary quits rose to 13.5 percent, largely reversing a drop in June. The unemployment rate for Hispanic workers fell to 4.5 percent, a new record low. 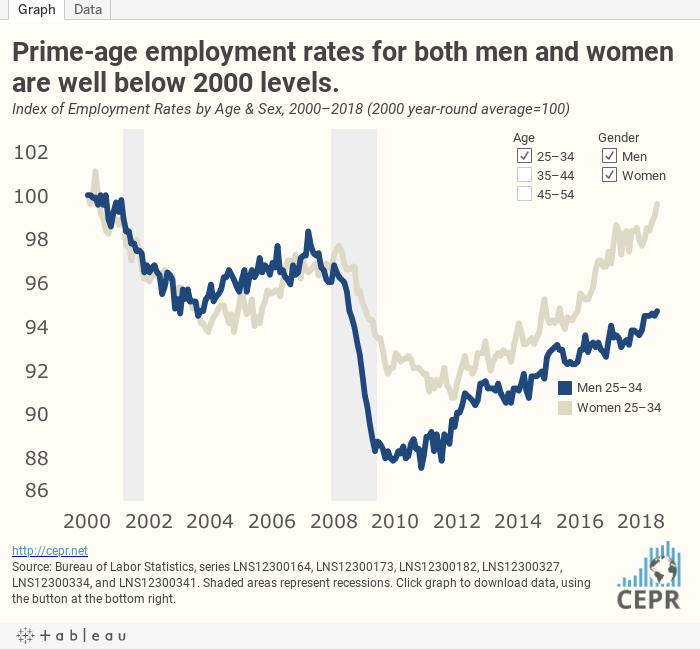 Looking at 10 year age spans for prime age workers, EPOPs have been rising for both men and women, although only women between the ages of 25 and 34 have recovered to their prerecession peak EPOP. Even this group is still slightly below its 2000 peaks. The trends in EPOPs suggests there is further room for employment to expand. The unemployment rate for workers without a high school degree fell to 5.1 percent in July, the lowest rate since the BLS adjusted its education measures in 1992. This is 1.9 percentage points below its year-ago rate. Less-educated workers have been the big gainers in terms of employment in the last few years of the recovery. While the unemployment rate for workers with less than a high school degree is well below the prerecession level and even its 2000 low, the unemployment rate for workers with a college degree, at 2.2 percent, is still above its prerecession low of 1.8 percent and well above its 2000 low of 1.5 percent. Workers with only a high school degree also seem to be doing relatively better, with a 4.0 percent unemployment rate matching the prerecession low (it had been 3.9 percent in May), although still above the 3.2 percent low hit in 1999. The idea that the labor market is becoming increasingly tilted to favor more educated workers does not appear to be supported by the employment data. This is, again, a solid jobs report in terms of job creation and lower unemployment. However, wage growth continues to be a problem, with wages barely outpacing inflation.